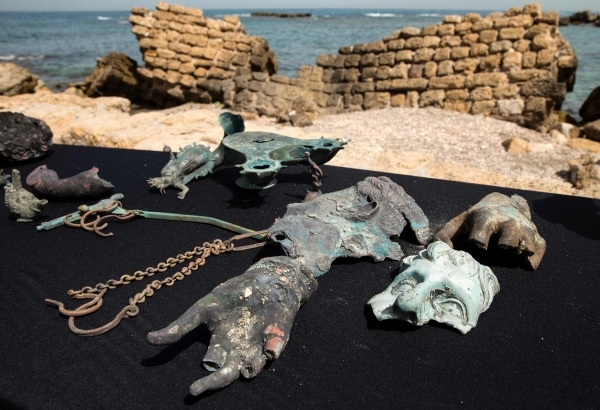 Israel's Antiquities Authority (IAA) has exhibited cargo from a merchant ship that sank off the ancient Mediterranean port of Caesarea 1,600 years ago, including rare bronze statues and thousands of coins. The find, happened upon by two divers a few weeks ago who then alerted the authority, consisted primarily of "metal slated for recycling" borne on the ship from Caesarea in the late Roman period, IAA experts said. But a storm at the entrance to Caesarea harbour crashed the large ship into the seawall and rocks, the IAA said, spilling the cargo into the sea and preserving the "exciting finds". 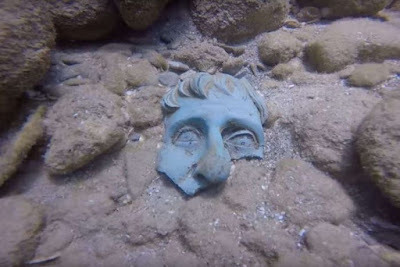 "Metal statues are rare archaeological finds because they were always melted down and recycled in antiquity," Jacob Sharvit, director of the Marine Archaeology Unit of the IAA and his deputy Dror Planer said in a joint statement, noting such a trove has not been found in Israel for 30 years. The artefacts include "a bronze lamp depicting the image of the sun god Sol, a figurine of the moon goddess Luna, a lamp in the image of the head of an African slave [and] fragments of three life-size bronze cast statues," the IAA said.